Launched in 1998, the Harley-Davidson Road Glide is arguably one of the most easily recognizable and distinctive American V-twin touring machines currently on the road. 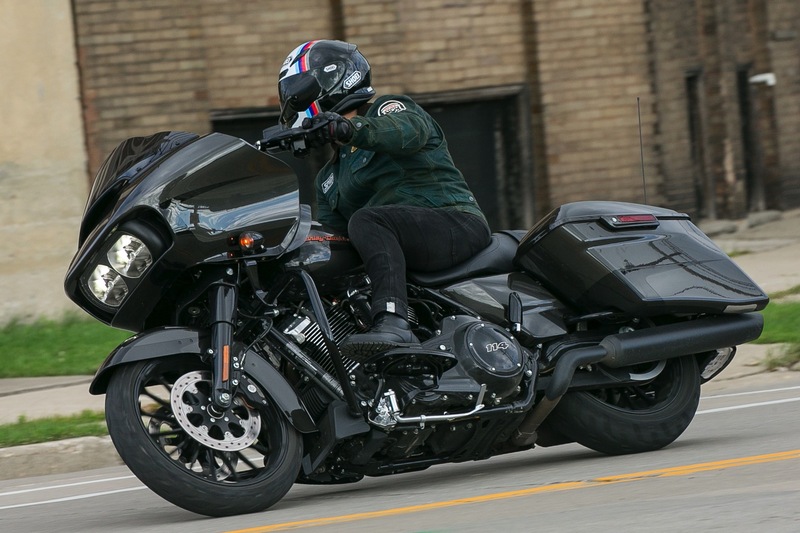 This year, the 2019 Harley-Davidson Road Glide Special 114 was treated to a handful of performance and technological updates that keep the RG Special in tip-top shape in its class. We spent a fair amount of time meandering through the Midwestern countryside on our way to Harley-Davidson’s 115th Anniversary celebration, and I made sure to thoroughly inspect every cheese-curd and fried delicacy along the way. For now, let’s get into the Fact Facts. 1. The Milwaukee-Eight 114 engine is standard on all Special models. Powering the Road Glide Special is H-D’s powerful 114ci V-twin, producing a claimed 123 ft/lbs of torque at a low 3000 rpm. One twist of the grip and you’ll immediately feel all that classic V-twin torque virtually anywhere in the rev-range. Thanks to the smooth fueling and flat torque curve, it’s a motor that virtually anyone can explore and get the most out of. 2. Touring bikes need to do it all, and the 2019 Harley-Davidson Road Glide Special 114 won’t let you down. During my ride, I experienced all that Midwest has to offer regarding roads—from long highway drags, commendable twisty roads, and even some unpaved backroads. I did a bit of everything, and the Road Glide Special didn’t flinch. Its long 64-inch wheelbase, and fork angle of 29.5 degrees kept the Road Glide Special in line, without becoming reluctant to turn in. Give it a slight suggestion and the Road Glide Special acquiesces. 3. Supple Showa suspension is up to the task. Featuring Showa’s Dual Bending Valve fork with generous five inches of travel, the Road Glide Special lives up to its name on good tarmac, despite the meager two inches of travel offered by the twin shocks. When the going gets tough, especially over the weather-worn Midwestern roads, energy from harder hits will inevitably be transferred through the chassis and into the rider. 5. Ergonomics meant for the long haul. With a seat height 27.4 inches, a great many people will have no worries about touching their boots to the ground. Comfortable riser bars keep your arms in a relatively neutral position, and the floorboards allow a decent amount of foot positions to alleviate soreness. The short windscreen works with the frame-mounted shark nose fairing to deflect air away from the rider, making those longer rides less taxing. 6. Toss the chrome and black it out—2019 is a darker year. Blinding chrome is a way of life for some, but for the Road Glide Special, H-D designers have opted for darker finishes and accents throughout the bike. From the 19-/18-inch Talon wheel combination, to the chassis and beyond, Harley-Davidson has created a series of mean looking Road Glide Specials. 7. 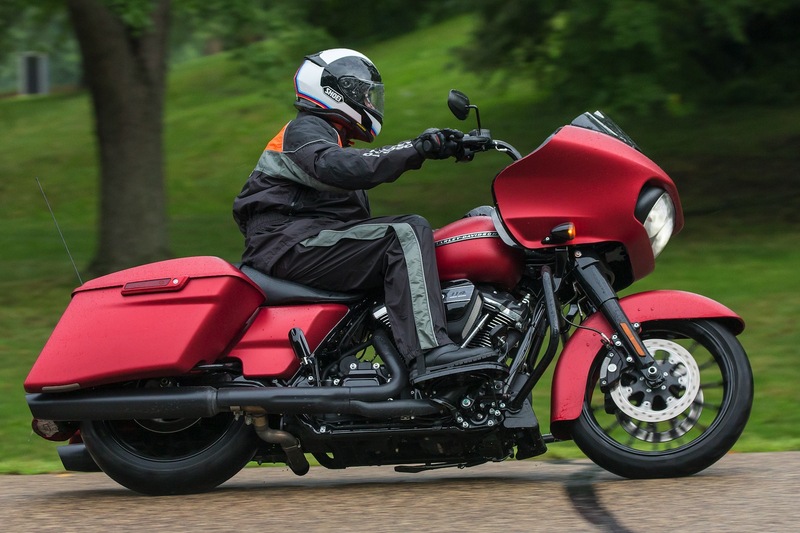 There’s plenty of braking performance on the 2019 Harley-Davidson Road Glide Special. 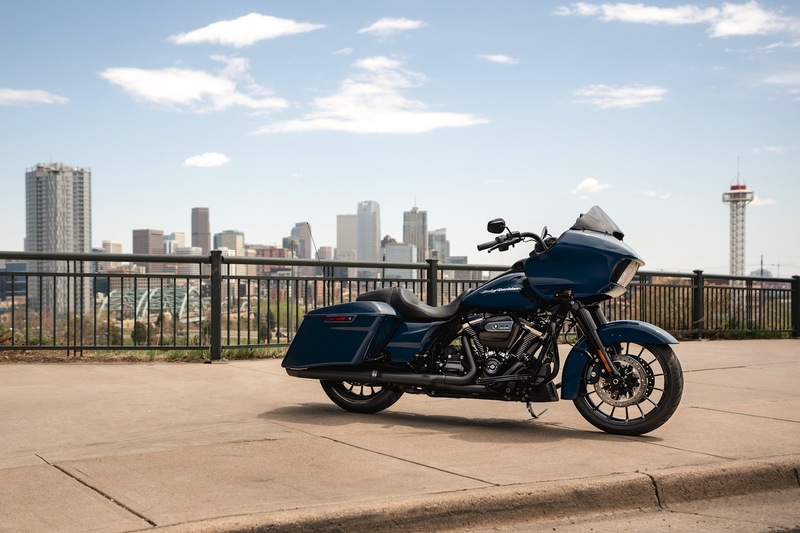 Though unchanged for the model year 2019, the Road Glide Special features the same dual four-piston calipers gripping upon dual floating 300mm rotors up front. Feel at the lever is on the firmer side, though progressive and easy to modulate. In the rear, a single 300mm rotor working in conjunction with another four-piston caliper gets the job done nicely. 8. The quintessential bagger has plenty of storage. With 75 liters of cargo space, you’ll be able to pack for short or long trips. One of the best updates that Harley-Davidson has done in recent years is to the luggage, which allows for tool-less removal, for easy access to the rear end of the machine during repairs or maintenance. Also, the one-touch release/closing lever is a great feature and latches into place confidently. 9. All Harley-Davidson Touring and Trike models now feature an updated Boom! Box GTS infotainment system. The upgraded GTS infotainment system bears a resemblance to its predecessor, but boasts plenty of new functionality that is in common with all our mobile Pinch, drag, and swipe, just as you would with a modern smartphone, tablet, or touchscreen computer. On the Road Glide models, the infotainment system is a bit of reach while in the saddle, though you can use the hand controls easily—it’s not too much of a worry. In addition to those improvements, the system now has faster start-up times and is ready to go within 10 seconds. 10. The Boom! Box GTS screen can be used with a gloved hand. Harley-Davidson teamed up with Gorilla Glass to create a touchscreen that can be used with any glove, rain or shine. 11. Boom! Box allows you to stay constantly connected. Operated with the helpful touchscreen or with the hand controls, the rider can pair a favorite communication device, smartphone, or both to the Road Glide Special and stay in constant contact with the world. You can take calls, respond to texts, navigate, stream music from your device, and chat with your riding buddies. 12. Apple CarPlay is supported by the infotainment update. For iPhone users familiar with Apple CarPlay in your other vehicles, you’ll be glad to hear that H-D has extended an olive branch to you in the way of greater compatibility with your devices. 13. The Harley-Davidson app is available for iOS and Android operating system, and it’s something that should be checked out. H-D designers have jumped on the app train and have created something that is helpful, and has fun features as well. The standout aspect of the app for me is the ability to generate routes from the comfort of your home, and then transfer them to your motorcycle when you’ve connected your device via Bluetooth or USB. 14. Kick out the jams while aboard the 2019 Harley-Davidson Road Glide Special. Two 6.5-inch speakers in the dash kept me occupied with talk radio while munching down highway miles. 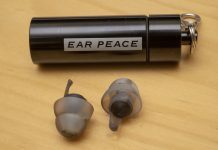 That’s impressive, seeing as I always wear earplugs with a full-face helmet. Also though it is one of the more modest speaker systems in the H-D Touring lineup, it is up to the task. 15. The 2019 Harley-Davidson Road Glide Special received modest updates and a dose of refinement. This year Harley-Davidson didn’t reinvent the wheel when it comes to the Road Glide Special. It is similar to what we rode during the launch of the Milwaukee-Eight engine two years ago. 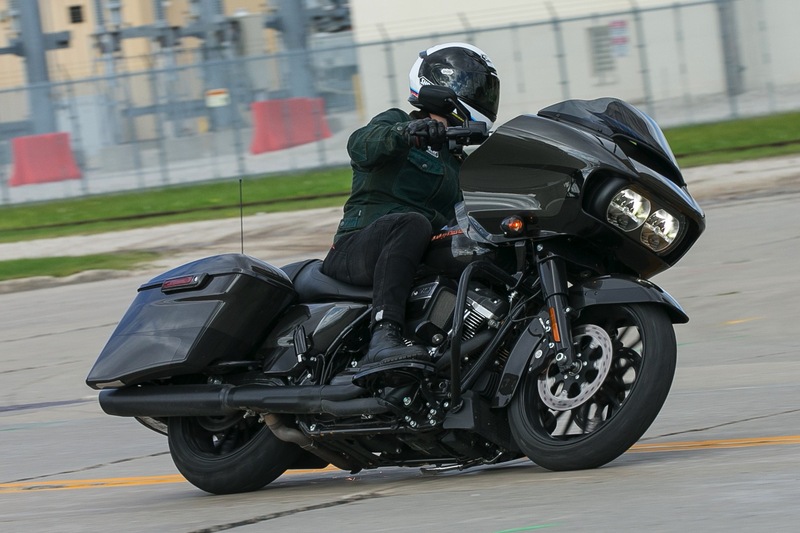 However, the increase in displacement, visual upgrades, and updates to the infotainment system are commendable, making the 2019 Harley-Davidson Road Glide Special as enticing as ever for V-twin touring enthusiasts.